You'll be £10.50 closer to your next £10.00 credit when you purchase Rigging Period Fore-and-Aft Craft. What's this? Employing superb, clear draughtsmanship this book illustrates each and every detail of the rigging of typical period fore-and-aft vessels. The rigging of period ship models is arguably the most complex task that any modeller has to accomplish; the intricacies can be daunting and visual references limited. The author's first book, Rigging Period Ship Models, was a triumph of clarity for those needing to decipher the complexities of square rig and has now sold in multiple editions. This book does the same for fore-and-aft craft and deploys three typical eighteenth-century types – an English cutter, a three-masted French lugger and an American schooner. Some 200 diagrams show clearly where each separate item of standing and running rigging is fitted, led and belayed. Whatever the requirements of the modelmaker, all the information is here. 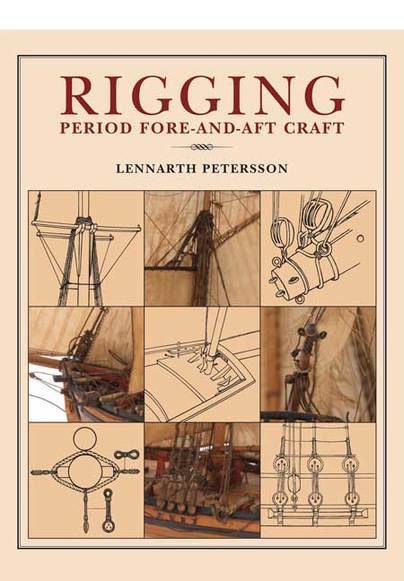 This new paperback edition brings a visual clarity to the complexities of period rigging and will delight anyone with an interest in the rigging of traditional fore-and-aft craft. This book is naturally highly commended to its target audience, but anyone with an interest in sailing ships will find it an interesting source of information that can be very hard to find. Here's another very useful little reference book from Seaforth Publishing for members who strive to achieve an accurate set of rigging lines on their models. The book brings a visual clarity to the complexities of period rigging and will delght anyone with an interest in the rigging of traditional fore-and-aft craft. It's not just for modellers but also a boon to traditional seafarers and readers of historical fiction. A huge boon to ship modellers but also to historians, even those working with the real thing. LENNARTH PETERSSON is a modelmaker and draughtsman and has spent years studying square rig. He has written for journals and periodicals and, amongst many commissions, has produced detailed interpretations of the Vasa for the Statens Sjohistorisks Museet in Stockholm. He recently wrote a companion volume on fore-and-aft rig.